All night the wind howled around the hut, such an amazing sound with wind driven light rain at times. A pretty good sleep really and certainly felt very safe and protected with 4 walls rather than usual hut with 3! Very thankful indeed, and feeling very looked after by both God and Perry. We woke before the alarm to that "grey dawn light" though totally dark inside the hut. Had a good wash so felt less grotty, especially round the botty. Had to have it first thing out of bed so I didn't run out of courage with the cold. Up early to look at the sunrise -- but only driving mist, so no sun. Lovely warm night in the "hut" -- felt like a new house with the fresh paint smell. The mist is quite wetting, so we're thinking of setting out in our wet weather gear. Hard to know if it's still coming in or clearing -- whether we should set off early or languish and go late?? We had most of our clothes on and wet weather gear. As we had breakfast the mist cleared and patches of blue sky emerged. A couple of bits of rainbow came and went, and I realise they seemed very foreign at sunrise, much more usual for us to see them at sunset. But I always feel a bleesing from God in them and this felt the same. Another easy day today -- and this did turn out to be easy. After getting up early for the sunrise (and not seeing it) -- but seeing lots of blue sky and Willie Nelson melodies above the mist, we decided to head off early (being 8:00am). By the time we'd packed and were ready to go it was a lovely feeling walking day. I swept the hut out, it was quite dirty and dusty (when we arrived), so I felt pleased to do it and give something back. Off we went on a very easy path in very good spirits. Lovely walking today in mostly unburnt for a while forest. Frequent orchids, 5 different varieties, mostly the yellow & red splashes, but blue lady, a pink small one and the sneaky hiding striped one. After descending the Southern Spur on the old Telegraph Road the track sets off toward the South-West across the flats with shallow creeks and Wandoo. Saw a mine at a distance. Went through a bracken understory quite different. Birds were gorgeous with their song, but one quite notable. P thought it was a bird in search of a song: quite amusing. Saw a red breasted robin, not sure if it was red capped or not. 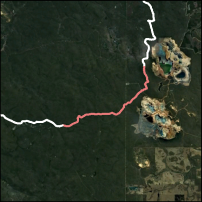 At 6.1 in the Guidebook (6.24 on our GPS) you pass under major powerlines then along a Wandoo lined creek. Evidence of previous logging activities become visible and we call a morning tea stop amongst the fallen logs. Soon after the track crosses Pindalup Road and then Coach Road, both major gravel roads, and crosses a broad flat watercourse before turning onto an old vehicle track that was simply thrilling to walk on: it is encased in Banksias, soft leaf litter on the ground and had a very strong sense of place (which we were very happy to be in). Delightful walk along the a creek to get here. Flat path sometimes, with a avenue of Banksias interlinked over the path and their leaves carpeting the ground under: very nice indeed. When we got to camp site here a lovely array of wee birds singing and darting around. One a definitely fan tailed bird, others we didn't know and couldn't see well enough. The morning was fresh and clean. We put off lunch again today until we reached the hut (today worked better than yesterday). It was uneventful, almost unremarkable, walk today -- so no huge sights or finds -- but just a lovely day to be in the bush on a walk: the forest had a wonderful enclosing feel today, like it was hugging us -- and we just bounced along. A number of times on the track, the passing (and gathering) clouds, the sun would sweep along the track toward us as the wind blew the cloud by: amazing sensation. Yesterday I definitely "trudged it up" and today I "skipped it down"!! The Guidebook mentions that Chadoora was apparently an old logging camp, and an old well is still in evidence: this encouraged us for a post lunch wander in the immediate area. The battery situation, although not desperate, is a bit of a concern with the amount of cloud cover: so we get the FUSE into the sun as much as possible in between showers. Few sprinkles and sun showers after we arrived, made me speculate that morning walking might be the go in current weather conditions. 1:45pm: A big down pour, thanks be to God we are here under cover. They didn't last long but very wetting at the time. Similar to what we drove through doing the food drops. Chadoora is a nice hut, nestled into the bush. The rain has come in more consistently this afternoon (glad we're not pushed to walk in it). Hoping that the FUSE can drag itself up to 3-4 lights by tonight: our batteries are tight at the moment with all this rain. Had lunch (extremely yummy), changed clothes and got our walking clothes drying and airing -- couldn't wait long till afternoon tea (with a cup of tea and a bar), now sitting writing and watching the showers come and go. The little birds are also very active: little blue wren and a fantail hunting insects on the wing. The bird song is beautiful -- with the bird looking for a song, to high twitters and tuneful chirps. Can life get any better than this? After a very relaxed afternoon of lunch - afternoon tea - dinner, little wanders into the surrounding bush and attempting to keep warm as we watched the showers come and go, we settled down in the shelter (not the tent, because of the rain). Set the camera up to charge from the FUSE (which didn't get past 3 lights), hoping that we'll have enough battery to get to Dwelling up tomorrow (where we can charge from a socket).